I am on my last day of vacation and then it is back to the old grindstone. Too bad it can’t last forever. My family and I spent the week at the Sagamore Hotel in Bolton Landing, NY on Lake George. We had a great time and I was able to relax, as much as one can relax with two children, for the first time in a while. 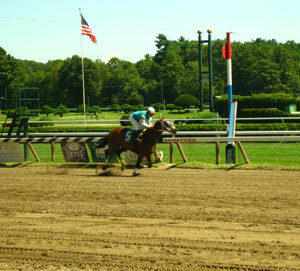 The trip started off with a stop at Saratoga Race track to watch the horses run. Watching the horses race was the closest I came to exercising for the day. The last time I had been here was 30 years ago. The fact that I can say that I was or did something 30 years ago is freaking scary. The place was as I remembered it, albeit smaller than I remembered. My father had taken me and my brother to Saratoga when we were kids and I liked the thought of taking my own children to the ancestral vacation lands. To top it off, I even picked a couple of winners. The next day I got in an easy, but hilly 8 mile run. The workout was nothing so special, but the whitewater rafting trip we took was. We had a blast flowing down the rapids and jumping into the water during the calmer sections. Later in the day, we went to the beach by the lake and we met a woman with her two kids who were staying at the hotel. Her daughter was wearing an M-Dot Ironman hat and when I asked who the Ironman was the reply was a loud Ironwoman. Our kids were all the same age and we wound up hanging out with them for several days of our trip. The first outing together was when we met at the kayak rental place. My plan was to swim around the island while my wife captained the kayak. Without another adult, Debbie, the Ironwoman had to row her kayak with her children in front and I tried to keep pace with everyone around the island. It was a good and satisfying swim. We stopped a couple of times where I played shark and would swim under the boats and pop up on the other side of them. Wednesday night we went to a Rodeo. It was a lot of fun to watch, but I am sure the calves that were roped would disagree. Thursday morning I ran a bit longer going closer to ten miles. Later I went to the pool with my kids where we played “Rough Seas”. This involved me dragging them around the pool on a kickboard and making them heave to and fro and then tossing them high into the air. My daughter had made some friends in the pool by now so I was throwing around more than just my own kids. After the pool it was time for tennis. We played for around 90 minutes which served as some good supplemental exercise. Later that night we met my fellow Ironman and kids on a dinner cruise that took us towards Lake George Village to see a fireworks show. Our kids had a blast playing with each other. Friday was our last day in Lake George and we made the most of it. Early morning was spent kayaking around the island, this time with me rowing my son in one kayak, with my wife in the other. 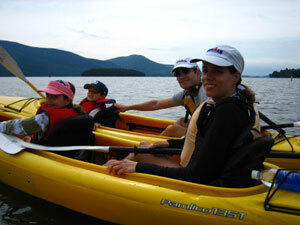 Debbie and her kids were in a third kayak. We raced to various points, which became hard for me as my wife wanted me to tow her kayak since she was getting tired. The water was a bit rougher and that made it harder for her to row. My wife was also getting frustrated from my daughter barking out commands. This was my only exercise of the day, but it was quite strenuous. Later we rented a motorboat and took the kids water tubing across Lake George. My face was sore from smiling so hard at watching the kids having such a great time tubing across the lake. After we returned the boat, we went fishing for a while from the dock. We didn’t catch anything, but had fun trying. We ended our day by watching a tennis exhibition being performed by the same people that are scheduled to put on a show at the US Open in Queens, NY. It was a good show which kept the kids interested the entire time. Sadly, we had to leave for home after the show ended. It was time to go home much to my great reluctance. We got home around 11:30pm, in time to watch the end of the Yankee game on TV. I fell asleep on my couch in the middle of the game and didn’t wake up until the same point in the game during the YES encore. I went up to bed and got up a few hours later to do an easy 6 mile run. There was no way I was going to do a long bike ride, as I just wasn’t in the mood. For the remainder of the weekend, I ran some errands and had some friends over with their kids. I wouldn’t be so down about my vacation’s end as long as I kept busy. While the kids were busy playing my friend and I went out for a couple of beers at a local pub to watch the Yankee game. We then went back to my house for dinner and then a trip outside for desert. Sunday was a quieter day, but highlighted by a trip to the Prospect Park Lake for some fishing. It was cool and rainy and apparently the perfect day for fishing in it. We caught a bunch of fish, which were carefully released back into the lake. It was a good way to end the vacation. Sounds like you had a nice vacation. Glad you're back, though. Going to do any of the upcoming races?